I honestly don’t know what to say. I just feel a need to write something. Maybe a need to connect with you, because I know many of you are parents. My daughter is five. She’s in kindergarten. Every time I have looked at her since she got home from school, I have strongly resisted the urge to burst into tears. Who shoots a five-year old? I cannot get my brain wrapped around that at all. 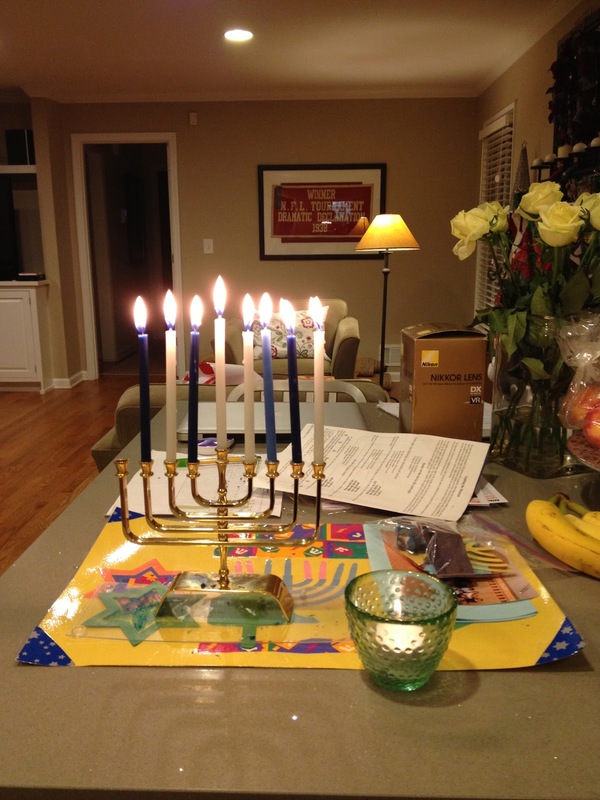 Seventh night of Hanukkah and one candle for Connecticut. I also said a little Kaddish to myself. For the babies and teachers and families. And my Dad, who died 21 years ago today. Good night, y’all. God bless you and your families. Hold each other tight and be good to each other and to humanity. Oh Karen, I’ve been the same way all day. You may have seen my oldest at the conference-he’s in kindergarten too. It’s unbelievable. I know. I just keep hugging my kids. Beautiful post. I can’t wrap my brain around it either, such a sad terrible terrible tragedy. Thank you. I know. It’s just awful.